Specialty presser feet and accessories can make sewing easier. Each month a different specialty presser foot or attachment and/or technique is featured and used to make two blocks. Explore many of the decorative stitches built into your machine and how to manipulate them to create yet more stitches. Have you ever drooled over some beautiful threads and wondered how in the world you could ever use them in your sewing? This class will teach you how. Embellishments can make sewing exciting; learn to make a few! This class will inspire you like never before! Your machine can do so much more than stitch straight and zigzag seams. In each class, I will demonstrate the featured foot or accessories and techniques for the month. Then you can practice it. The learning is then applied to making that month’s blocks. There is homework! There is usually some pre-work to do prior to the class. Class sessions are not long enough time complete the blocks so blocks can be started in class but are usually completed at home between classes. Plan to bring your previous months’ blocks to each class. Presser Feet purchased for this class from Charlotte Sewing Center are discounted. We carry Pfaff and Babylock feet. 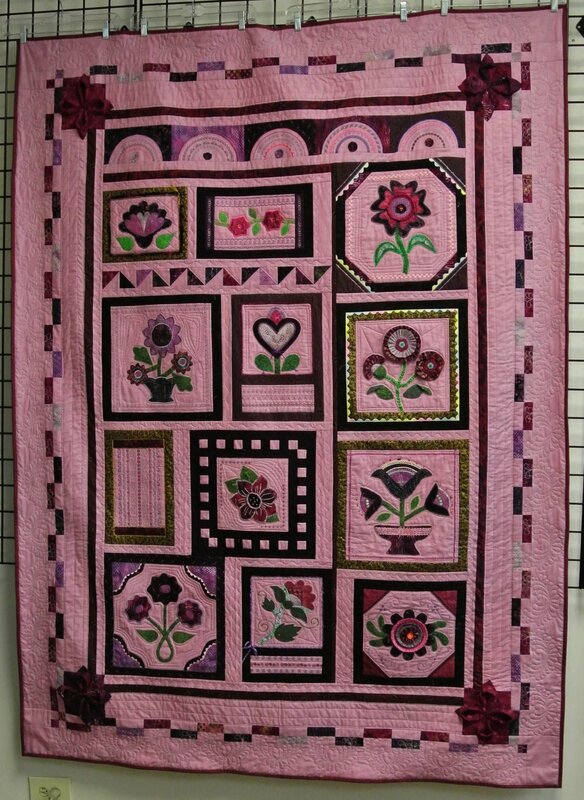 I also offer Quilters Dream quilt batting for this class at a discounted price. Stitcher’s Garden 2 is a quilt design by Lynda Howell of The Stitch Connection. I have converted the pattern to QUILT-AS-YOU-GO which means each block is quilted as it is constructed and then the quilted blocks are sewn together. The border is added to the sewn-together blocks and quilted by machine. If you have an embroidery machine, I will show you how to quilt the border ‘in the hoop’. Quilt-As-You-Go (QAYG) is an easier way to make a quilt on a sewing machine. If you prefer, you can make it as a TRADITIONAL quilt top by sewing the blocks, sashings and borders together, making the quilt sandwich and then you can quilt the entire quilt or send it to a long arm quilter. Click HERE for a partial list of the monthly feet, accessories and techniques. Click HERE for Materrials and Supplies List for the class. Materials list will be emailed prior to classes. Provide your own sewing machine, preferably one that has at least a few decorative stitches in addition to straight and zigzag stitches. You also provide your own fabric, thread, stabilizers, presser feet, etc. You will get a class supply list by e-mail prior to the first class and a project supply list at each class or by email for the next class. Questions? Contact Susan at debonair2@bellsouth.net or 704-674-4391.